This is the most beloved toy and has been for quite a while. My very first blog post was a detailed review of it. Both dogs love to stick their heads in the Kyjen tree stump and fish out the squeaky squirrel. We are currently without a Hide-A-Squirrel because I will pitch toys with tears or pieces missing, but I think based on the amount of "love" this toy gets, two in ten months is not so bad. We have two Hurleys and a Bumi from this West Paw Designs line, and I'm tempted to say they are indestructible as far as my dogs are concerned. They don't have a mark on them, they are made of non-toxic material. The girls play with the Hurleys, which are a nice size and shape for fetching, daily, and they play tug together with the Bumi. 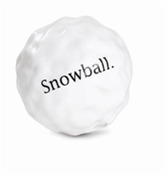 Planet Dog makes a great many fun toys, including balls shaped like vegetables, lumps of coal and this snowball. They all have a minty flavor and a soft texture, as well as a "treat spot" for turning them into treat-dispensing toys. This white ball is on Ruby's frequent fetcher list, and has almost no signs of wear except for the faded lettering. 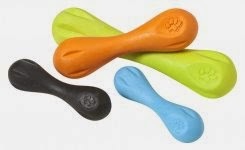 Cycle Dog toys are made from recycled materials, and they are a fairly new, earth-friendly company. The dino toy is in high demand at my house, with Ruby and Boca vying for it regularly. It has a funny and unusual squeak, and is another toy that can double as a treat-dispenser since its belly is hollow. They have managed to amputate all of the dino's limbs, so it is not entirely chew-proof, but I think some of the other creatures with less pronounced appendages would hold up better. Kong is well known for its heavy duty interactive toys, and the Mike is one of the few toys I trust to be down when I'm not home. Its shape makes it an interesting fetch toy as well as a challenging puzzle when filled with treats. Disclaimer: I was not compensated in any way for this review and purchased all of these toys myself. Dogs should always be supervised when introducing new toys and toys should be replaced when damaged. Cycle Dog, Planet Dog, Kong and West Paw Designs toys are made in the U.S.A. The Zogoflex toys have no smell at all, and the Planet Dog balls smell like peppermint. I think West Paw has become one of mine and Buster's new favorite toy companies. He got the Hurley bone in a HeroDogBox, and it quickly became his new favorite toy. I've since purchased a couple others that he also loves. The rubber Kyjen hide a squirrel is genius! We may have to try that one soon. I am always on the lookout for durable toys. Thanks for the recommendations! They make a plush version also, for those less-destructive dogs. I'm going to have to check these out. Twofus is horrible about eating plush toys. I've stopped buying them because of him. We almost had an obstruction scare, but thankfully it came out the other end with some assistance (EWWW!) I think Kita hates him for this (her favorite toy is a stuffed pig that makes an awesome honk noise). I still end up with plushies as gifts or in subscription boxes, and Boca is allowed to play with them. Once in a while I'll let the girls play tug with one under close supervision, and I remove the squeaker and stuffing as soon as there is a hole, but in general they are not a favorite around here. The piece Ruby ate was small, and nothing showed up on xrays but it did cause vomiting and not something I want to mess around with! I always think it's so cute when dogs are gentle with plushies and carry them around like babies - my dogs are not those dogs! I didn't even know they made a rubber version of the Hide-a-Squirrel! Now I want it. I'll have to check those out for Theo. He's ruthless when it comes to toys!